I don’t know who the person was who created this lovely little treat, but I hope they enjoyed some sort of Nobel Peace Prize for their efforts. This stuff is truly magnificent, and it’s totally unassuming because of it’s relatively simple ingredients. Who’d have thought that this thrown-together snack of pantry staples could be so damn good? 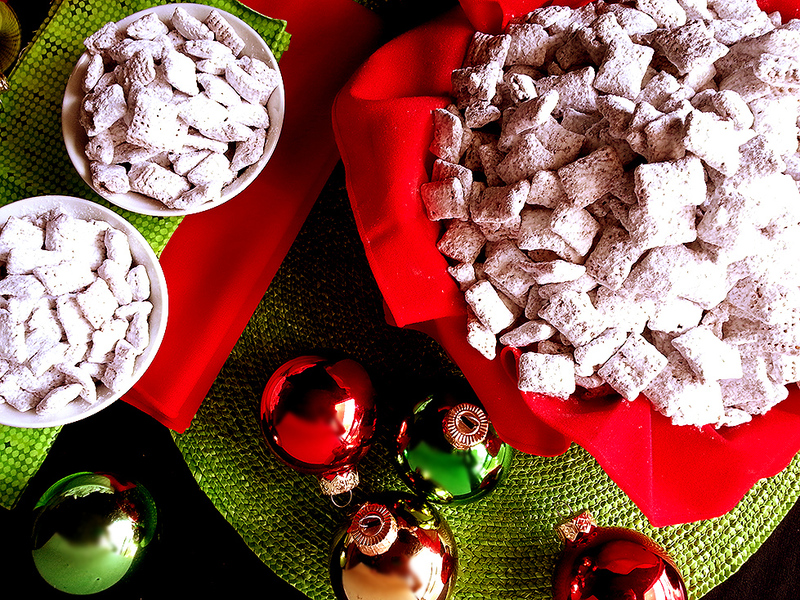 While the original peanut butter and chocolate combo is nothing to sneeze at, some dear soul on Pinterest went ahead and posted a photo of puppy chow made with Andes mints. You remember those thin little chocolate-y, minty pieces of heaven so often brought with the check when you go to Olive Garden (at least that’s how I remember them best)? I knew when I saw that photo, that I had to make a rendition with those little chocolate mints. Here, they’ll replace the usual chocolate and peanut butter, for a wintertime treat that is perfectly at home among all the plates of iced sugar cookie snowflakes and gingerbread men! This may very well be one of the easiest recipes on the planet. Start by dumping your 9 cups of cereal into a large bowl. Grab a sheet pan and line it with some parchment paper, then set the pan aside. In a medium sized bowl that’s safe to go into the microwave, add your chopped Andes mints and your butter. Microwave this on high for 30-45 seconds, and stir it until it’s totally smooth. 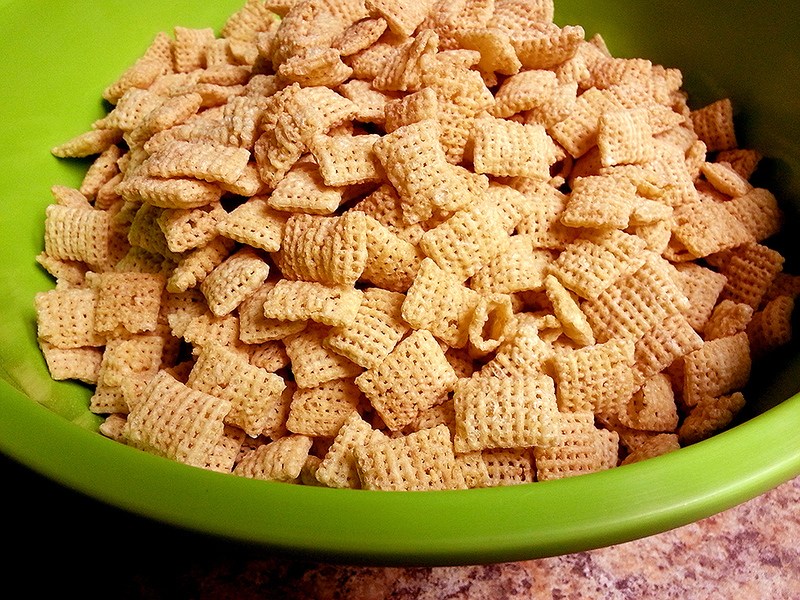 Pour the melted mints/butter on top of the cereal and stir well to coat all the cereal with the minty goodness! It takes a bit of stirring, but you want to make sure that all the cereal is covered. Put half of the powdered sugar into a 1 gallon Ziploc bag. Scoop in half of the cereal mixture, close the bag, and shake it vigorously to coat all the cereal in sugar [a tasty change would be to shake the cereal in a mixture of half powdered sugar, half cocoa powder! It’d cut down on the sweetness and provide more chocolate flavor]. Dump the coated cereal on to your waiting sheet pan, and repeat the coating/shaking process with the other half of the powdered sugar and cereal. This stuff doesn’t need any time to sit and dry or anything, it’s ready for scarfing as soon as it’s out of the bag! If you plan on serving it immediately, dump it into a big, festive bowl and have at it! It’s perfect for your Christmas parties and the kids will love it, for sure. If you plan on saving it to eat or serve later, it stores perfectly well in Ziploc bags or a large airtight storage container. It should stay crunchy and good for up to 1-2 weeks if stored properly, but seriously, who would wait that long to eat this stuff? It’s too good. You’re welcome.